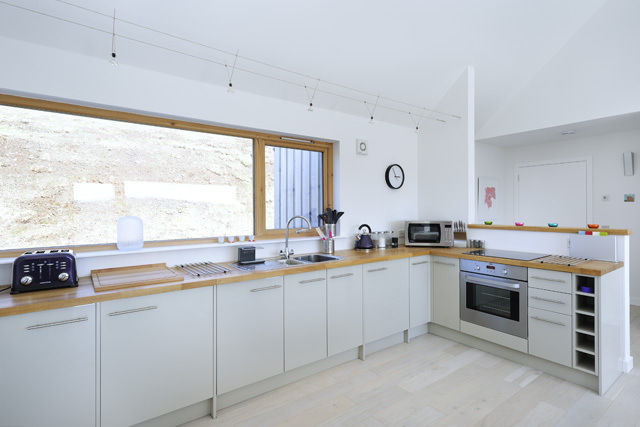 White-Tail Croft sits is a fabulous hillside location just a short distance from the town of Portree. The property is newly completed and architecturally quite striking. With open views surrounding the property, and with walking available from the doorstep, White-Tail Croft makes an ideal base for a relaxing Wilderness Cottage holiday. The property is spacious and light, and stylishly furnished in a modern contemporary style. Inside the accommodation is all located on the one level, and consists of a large open plan lounge/kitchen and dining room, two double bedrooms, a sauna/shower room, a separate bathroom, and a small utility room. 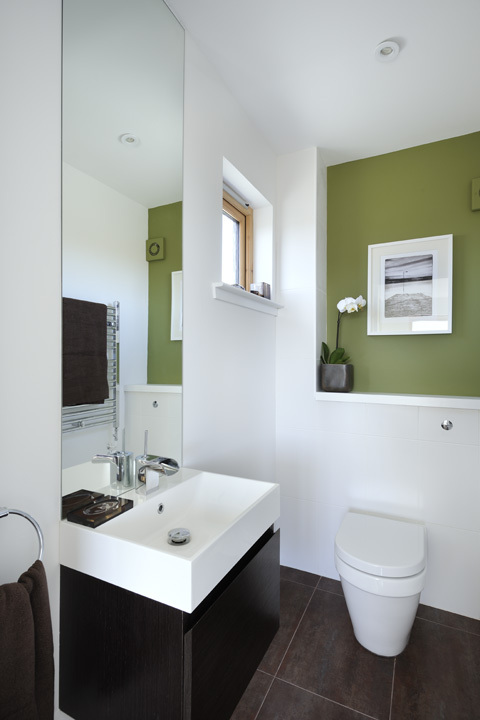 The master bedroom has an en-suite toilet, which also offers access to the shower/sauna room. The lounge/kitchen area has a vaulted ceiling, and floor to ceiling windows, ideally placed to take full advantage of the views. Direct access is also available to the exterior decked area to the front of the property. 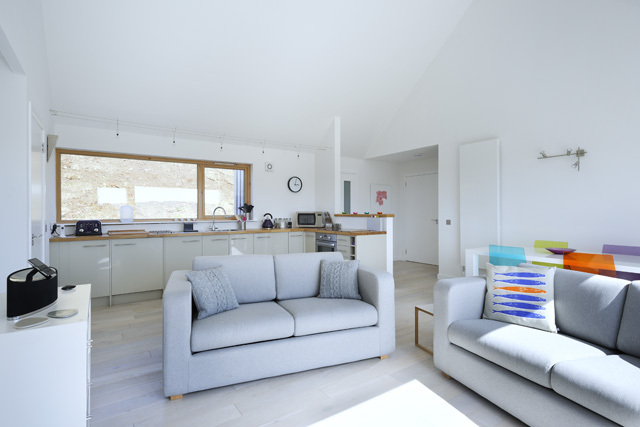 This room also benefits from a wood burner ideal for those colder evenings, however the house throughout has central heating and underfloor heating in the bathrooms, which ensures it is warm no matter what time of year you visit. The town of Portree is located just six miles away and offers a good range of facilities for the visitor, including a number of cafes, restaurants, a tourist information centre, and a range of interesting shops, many of which sell artwork by local artists, and crafts and other items which are made on the island, a popular choice being the Isle of Skye Soap Company. The harbour in the town is quite picturesque with its brightly painted buildings, and from here boat trips are available, allowing the visitor to view the local bird and sea-life. The scenery on the island is quite spectacular and White-Tail Croft makes an ideal base for those guests looking to explore the island. Not far from Portree you will find the region of Staffin, home to the Trotternish Ridge and the cliffs of the Kilt Rock. The area offers some of the most dramatic scenery on the island and is well worth the trip, whilst here why not also enjoy discovering about the history and archaeological past of the island at the Staffin Ecomuseum. No matter what your interest the island really does offer something for all ages. At Broadford the Skye Serptarium is always popular with younger guests, and the island even has its own distillery. Located at Carbost, Talisker Distillery offers various tours including a tasting tour. For history lovers Dunvegan Castle, the ancestral home of the Chief of the Clan MacLeod, has to be visited. Located in the north-west corner of the island, the castle offers a perfect day out. White-Tail Croft is a superb place to spend a winter break. However as the property is situated in a remote glen with access via a single track road, during the period December through to the end of February road conditions can be difficult. It is therefore a requirement that any guest looking to book during this period has a 4 x 4 vehicle. Please contact our office direct before booking if you would like further information. 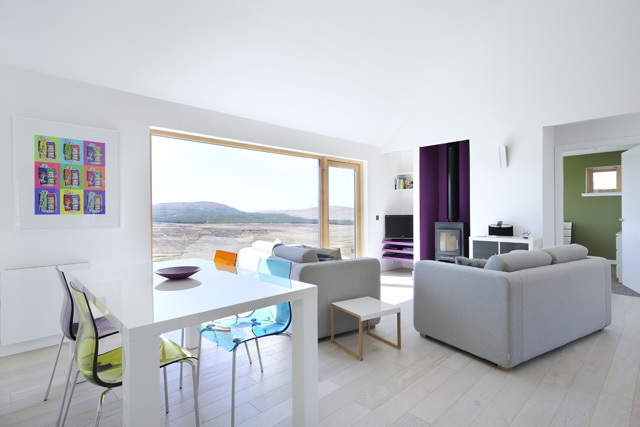 Open plan lounge / kitchen / dining room, with moorland views, and offering direct access to exterior decked area. 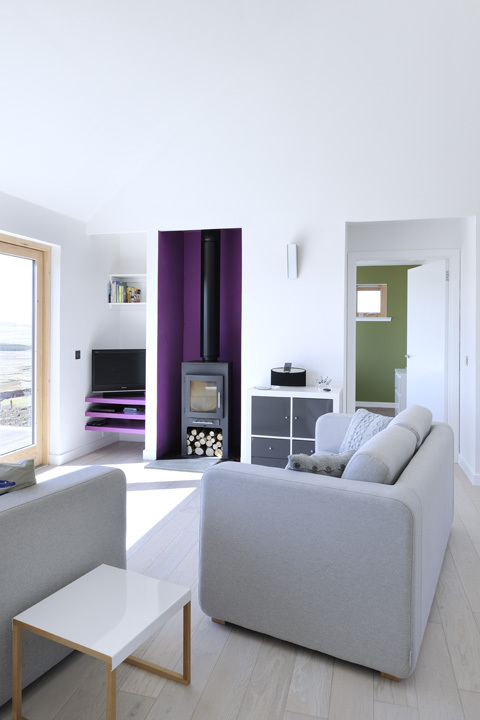 Lounge, comfortable sofas (one of which is a sofa-bed suitable for one guest), wood burning stove, flat screen HD TV, freesat with hard drive recorder, Blu-Ray DVD, CD player, radio and iPod docking station. Kitchen, ceramic hob, electric oven, microwave, fridge, dishwasher and all the usual equipment. Utility/boot room with washer/dryer and freezer. Master bedroom, king size bed, en-suite with wc & whb, direct access to shower room and sauna. Separate bathroom with bath, whb, wc, heated towel rail. All bed linen & towels. Logs for the wood burning stove. Central heating & under floor heating in the bathrooms. Enclosed garden with decked area to the front. Indoor storage for mountain bikes etc. Spectacular newly built contemporary property. Rural location, with walking from the doorstep into the neighbouring hills. Amenities of Portree just a short distance away. We had a lovely week at White-Tail. Gorgeous, well-equipped cottage in a great location. The view was absolutely stunning - even on the cloudy days we had. Would definitely recommend! We had a superb holiday at this property. 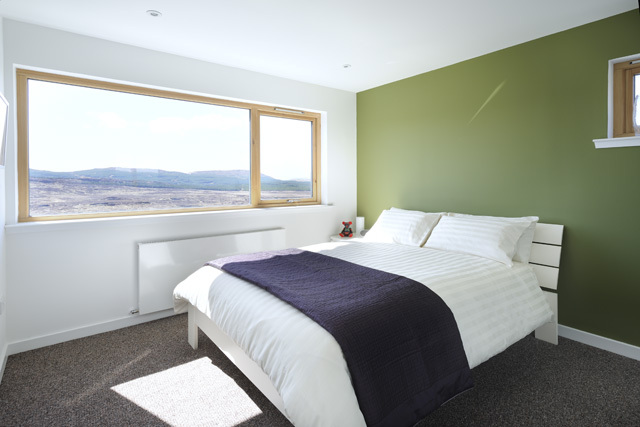 The location feels remote but is only 15 minutes from the supermarket on the outskirts of Portree. Very well appointed and comfortable. We had very mixed weather but even on our few days spent indoors, the views of the constantly changing sky and colours in the landscape from the floor to ceiling window in the lounge were a joy. We did see sea eagles and hawk harriers, magnificent starry skies and the occasional shooting stars.The satellite WiFi is perfectly functional for browsing but does not accommodate streaming which was fine for us. We took a couple of DVD box sets and there was Freeview TV available. 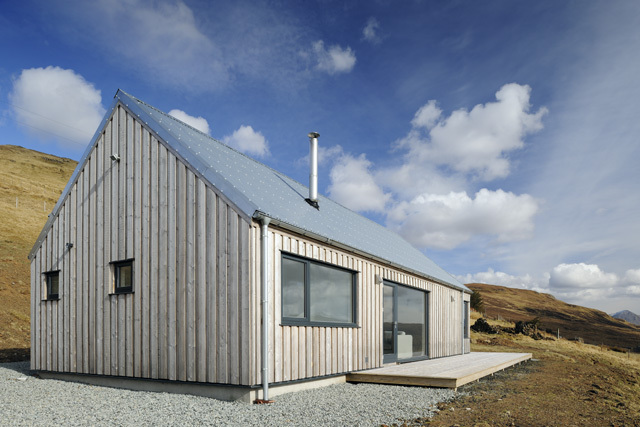 If you are looking for total peace in beautiful surroundings with a view of the Cuillin mountains in the distance, do not hesitate to book this property. It is brilliant value for money and we hope to visit again. The house is just perfect. Located just 15-20 minutes from Portree but in it's own little wilderness at the end of a valley, with spectacular views of the Cullins. The house was spotlessly clean with a lot of attention paid to all kinds of details - it feels like a real home that someone has put a lot of effort into and not just a place that gets rented out. We loved it. This is the best accommodation we have ever stayed in and we have had lot the views and facilities are first class we will definitely be booking again the only downfall is the pot holes in the road. Fantastic hideaway. Great cottage with everything you could ask for and more. Beautiful scenery, thoughtful welcome pack and a sauna. We love Skye and this was one of our best finds yet. No hassle from booking, finding the house and even the weather was kind to us. We will be back. Fabulous cottage, exceptionally well fitted out - the owners have thought of everything you might need. One of the best we have stayed in. 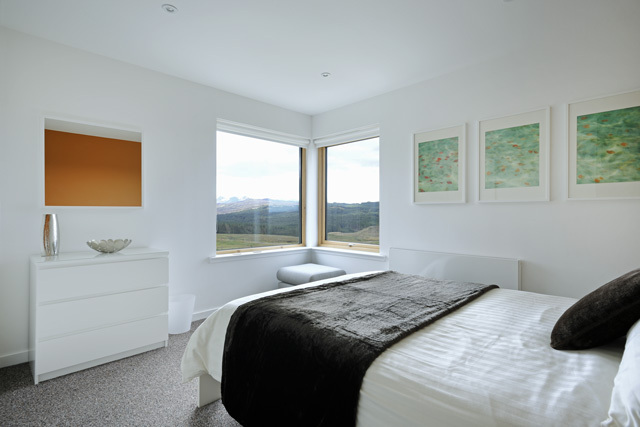 Great position, with views of the Cuillin, feels remote but is only a few miles form Portree. 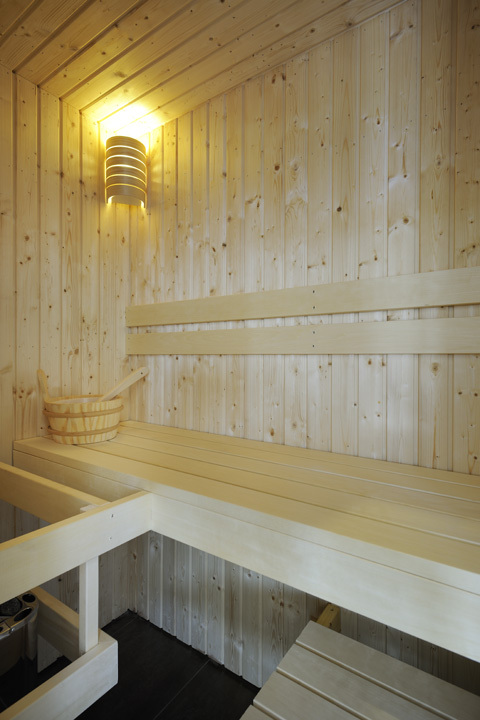 The sauna was much appreciated after a day out walking. Beautiful location and cottage. Views are amazing but we were up in the cloud for two days! Saw sea eagles on the last day - better sighting than the ones from the sea eagle boat trip that morning! Cottage is very well equipped with everything you need including maps, books on local area etc. Would recommend to those who don't mind being in a quite isolated location and single track roads to get to it! We had truly a phenomenal stay at White-Tail Croft. The croft itself is to the highest standard, with stunning views; we saw many birds of prey hunting outside the croft, and with deer and rabbits making use of the fields surrounding us. Absolutely loved our time here, and are aiming to come back in the future! Fantastic cottage in a fantastic location and the owners very generous with welcome pack. Absolutely marvelous, such a peaceful place! Great facilities by the way. An improvement would be a better wi-fi, because the connection can be low sometimes. We spent our half term break staying here and it was wonderful. The setting and the location is incredible, the Croft itself is very comfortable, has a great log burner and sauna and is the perfect get away at any time of year. We would love to go back in the Summer time as it was rather wet in February but we were expecting that anyway and we were still able to get out and about regardless of the weather. This is perfect for a young family or couples looking to escape from the realities of the world for a while! 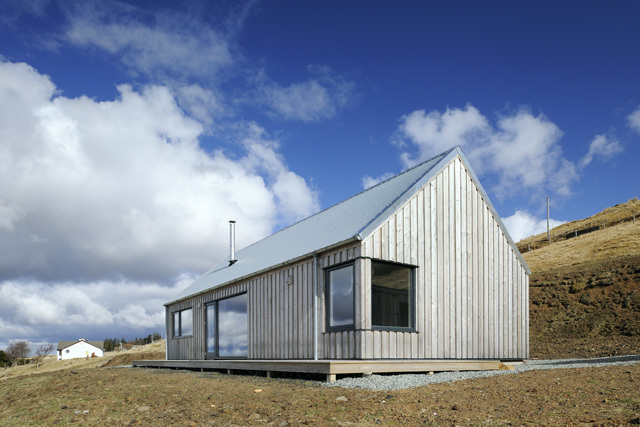 Our second visit to White-Tail Croft and it lived up to our expectations again. It's a beautiful, well designed building and everything you could possibly need is there. Very special to sit on the decking watching eagles soaring overhead. Peace and quiet in a stunning location - we will be back! White-Tail Croft was everything the other reviewers have noted and more. For us it was a gorgeous refuge for a week of typically changeable Skye weather, and looking out of that picture window while the weather systems were in constant flux overhead was an absolute treat. We too enjoyed the local wildlife, including the resident sea eagles. And it was perfectly located to enjoy all that Skye has to offer. I can honestly recommend this cottage with absolutely zero hesitations, thank you to the owners for presenting such an impeccable experience. What can I say? From the moment we arrived at White-Tail Croft we were stunned by how perfect it is. The building itself is appealingly rustic on the outside but so light, airy and warm on the inside. 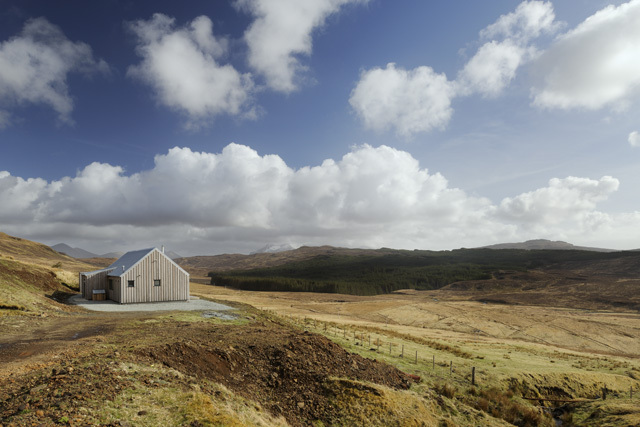 The setting is beautifully remote, with enviable views over the Cuillin ranges and a steady stream of wildlife around the property, from sheep to rabbits to deer, and even the odd eagle sighting. Inside, everything is catered for. We found the log burner stocked and ready for lighting, a great espresso machine stocked, toiletries supplied in the bathroom, bottled water, a head torch and binoculars so you can see those eagles. The handbook for the property was clearly presented and covered everything we could wish to know. The rooms were tastefully decorated and the beds and sofas were all so comfortable. We loved lying in bed looking over the mountain views in the morning and watching the sun set over dinner in the evening. We could not fault White-Tail Croft and were really sorry to leave. We will undoubtedly return and not hesitate to recommend it to friends and family. We could have banqueted on the view forever. The Croft was spotless and had all that wanted. The sauna was wonderful after a days walking. We will definitely return. Sheer perfection. What a dream come true; views to die for, a sauna to warm you up, a fire to get cozy to and everything in perfect condition. There's almost no traffic as you're on a road with a dead-end, plenty of rabbits and eagles to view from your doorstep and trust me, the cottage is storm proof! We had our honeymoon here this beginning of March and thoroughly enjoyed ourselves. Don't hesitate, this cottage is the perfect get-away. We enjoyed a wonderful stay at The White-Tail Croft in October 2014. Over the cottage is sufficiently described in the other reviews. But, the big windows, the great terrace after cooling down after sauna, great views of the wild land, deer, birds of prey, sun and sunset and the silence are absotlute sublime. Stunning and stylish cottage in great location. In the middle of nowhere yet only 15 minute drive to Portree. Really clean. My wife and I have recently spent a week at White-Tail Croft. What a fabulous setting and fabulous Cottage. Whilst very modern it fits the landscape very well. This property is of the very highest standard and we can recommend it to anyone. The only thing I found to be missing was a shaver point in the bathroom. A minor fault I know. We have been with wilderness cottages numerous times and cannot fault them. We will be back to one of their cottages very soon.